GREEN BAY, Wis. — Detroit Lions kicker Matt Prater lined up for a field goal but seemed a little antsy, gesturing with his arms like a quarterback calling for a shotgun snap. Prater’s 8-yard pass on a fake field-goal try was high and a little wobbly, but Levine Toilolo was so wide open in the end zone that it didn’t matter. 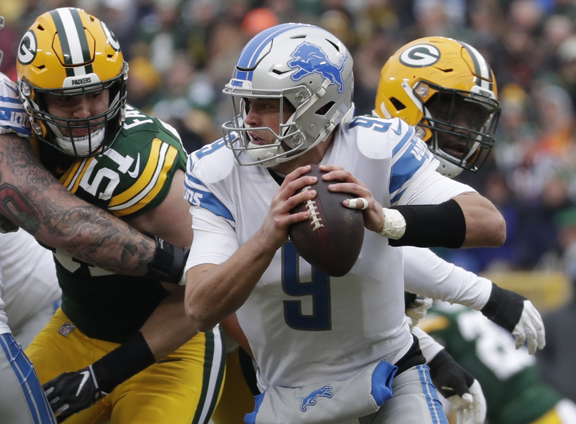 Not so much for the Packers (6-9-1), who trailed 21-0 at the half and lost Aaron Rodgers early in the second quarter to a concussion. The quarterback was sacked and lost his helmet on the second play of the game. Matthew Stafford threw for 266 yards and two scores, both to T.J. Jones. Zach Zenner had a 13-yard touchdown run for the Lions, who have won four straight against their NFC North rival for the first time since 1982-83. That was one bright spot for a last-place Detroit team.